When Kate and I discussed the initial #FirstOnTheFirst challenge for 2013, we decided to select something easy. Something that people probably haven’t made before, but that wouldn’t be too daunting of a task, so as not to scare anybody off. Something to instill confidence and get the year started off on the right foot. Thus came florentines. Delicate, crunchy cookies that add a little sense of culture. Fancy without being fussy. My kind of treat. When I said florentines, I meant lace cookies–cookies spread out so they look like a doily with the holes in them–so I made Oatmeal Lace Cookies. Which are kind of like florentines, but not really. More like every oatmeal cookie I have ever tried to make, as I am notorious for my dough spreading an obscene amount and making me look like a darn fool. I never seem to manage plump, chewy oatmeal cookies. This was in the bag! And it was. Really. I can’t complain about the process. The batter came together really quickly. 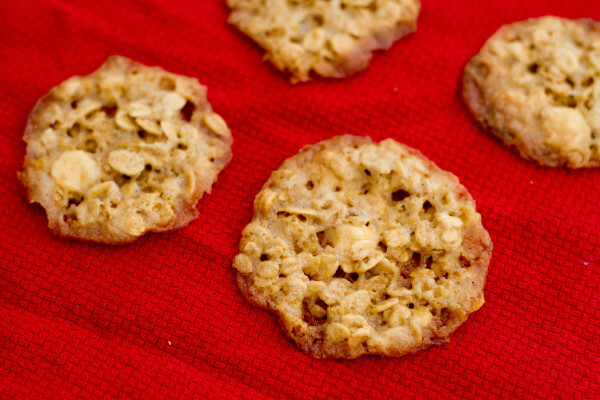 It was a little tedious portioning out only 6 cookies at a time, but after seeing Kate’s Florentine Brittle, I was a little on edge and not in the mood for the equivalent of lacy oatmeal bar cookies. There’s just one thing. I skimped on the butter. By half. No wonder why it seemed like it went so well! Preheat oven to 350 degrees Fahrenheit. Line 2 rimmed baking sheets with parchment paper and set aside. In the bowl of a stand mixer, cream the butter and sugars, beating until light and fluffy. Add the extracts and mix until just combined. Add the flour, salt, and oats, mixing on low until just combined. Stir in the white chocolate by hand, being careful not to overmix. Portion out the dough with a teaspoon, being careful not to place too much. Space at least 2 inches apart on sheet. Bake one sheet at a time for 9-11 minutes, or until lightly browned. Remove from oven and leave on sheet for 8 minutes before transferring to a wire rack to cool completely. Next month we’ll be decorating cakes. I’m shaking just thinking about it. I am an eater, not a decorator, so this will be interesting… Take on a new cake decorating technique and join us! We’ll be posting on March 1st at noon. Check the First on the First tab above for more details. How did everyone else do with this challenge? I saw some oatmeal versions and opted to go with the classic – I think I would actually much prefer your oat verson, these sound delicious! Your florentines turn out perfect! I’m thinking perhaps I should have used a recipe that called for oats. Maybe that would have lent a hand in making mine successful 🙂 Love the orange extract and white chocolate morsels in yours too! Yum! I bet these were delicious. I think it’s the fact that I forgot half the butter that helped. That gave them less of an opportunity to spread out, because even these spread quite a bit. They were a big hit at work, so I guess I can’t complain. I just didn’t expect these to be so challenging for everyone! These look delicious! 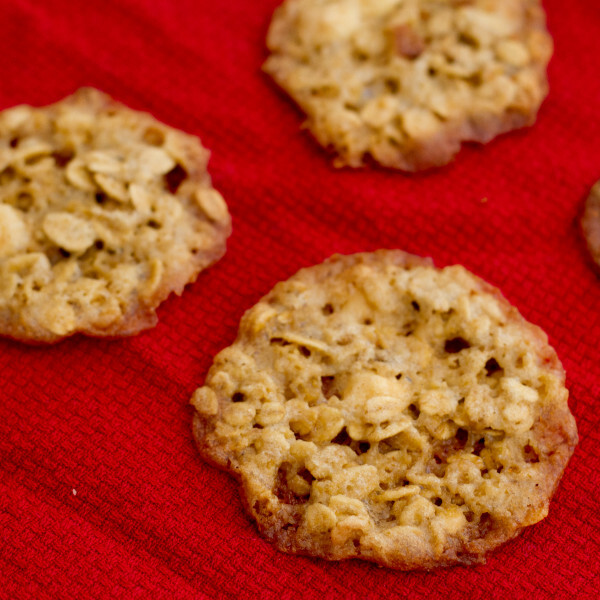 I love oatmeal cookies, and this recipe intensifies my love. Did you edit your recipe in the print version to be half of the butter, or did you actually only use 1/4 cup? The version below is the edited, one-half butter version. 🙂 Why mess with it if it works, right?